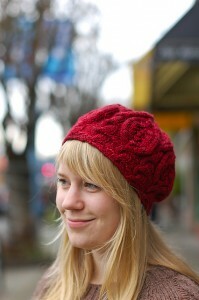 I so enjoy perusing the projects of friends on Ravelry. There’s a certain amount of excitement whenever I see that someone has finished an ongoing project or even popped up with something I didn’t even know they were working on. It feels a little bit wrong somehow, just checking up on people without them knowing it, but their projects are so full of pride and inspiration when they post them! Kynna never disappoints, her two newest projects are just stunning. Both in colours I have a serious affinity for, Madelinetosh Glazed Pecan and Tart. First up is Rose Red by Ysolda Teague. I think Kynna has knit more than half of all the Ysolda patterns by now, if not she’ll get there soon! Next is a popular pattern, the Honey Cowl. Simple but fun, the pattern shows off the stunning yarn and subtle colour variations. To make a Honey Cowl of your own you will need about 400 yards of a dk weight yarn, something soft and sumptuous to kick off the new year! This entry was posted on Tuesday, January 3rd, 2012 at 12:03 am	and is filed under Uncategorized. You can follow any responses to this entry through the RSS 2.0 feed. Both comments and pings are currently closed.